If you are looking for the quality and reasonable-priced stainless steel hardware, Luju will be your best choice! Established in 1991, Luju Enterprise Co., Ltd. was with extensive experience in hardware industry. They specialized in stainless steel hardware for both industrial & marine applications, and their products are shipped to USA, Latin America, Europe and Asia. Luju manufactures friction hinges, cleats, vents, latches…etc. They are able to provide nearly every stainless steel spare parts used on the boat with corrosion resistant finish. Luju produces including glass hardware, door handle, shower hardware, and much more hardware. Also, they can make hardware with many kinds of materials according to customer’s request. For example, zinc alloy and brass for building industry. Based on strong design and manufacturing ability, nearly all stainless steel hardware is designed by Luju engineering team and they have got worldwide patents for many of the products. Luju products are made by various production processes, including casting, hot-forging, cold-forging and stamping. Luju has capability to customize special machine based on the requirements of products. Luju created corrosion resistant finish to stainless steel. The electro polishing process not only gives stainless steel a mirror-like finish but also extremely corrosion resistant. The titanium plating is using the most advanced technology which enables them to offer a wide range of stainless steel finish with various colors. Luju Enterprise Co., Ltd. is in stainless steel industry for more than 20 years, they are well-experienced in sourcing the suppliers who has high quality with competitive price to customers. They mainly supply these products to Asian and Middle East countries regularly. Today, if you have requirement of extensive range of high quality stainless steel products with special finish, no hesitation, send inquiries or contact with Luju for more details! Paper plates, paper bowls, and paper cups are disposable made out of paper and lined with wax or plastic to prevent liquid from soaking the paper. These paper containers are made using food grade paper, which is hygienic and capable of storing both, hot or cold liquid for long times. Since these items are lightweight and can be easily disposed of, they are very convenient to be carried to any place for serving food items. Moreover, these containers are available in a wide range of designs and sizes to meet the needs and preferences of consumers. With the rising awareness of Eco-friendly and rapidly changing lifestyles, the demand for paper plates, paper bowls, and paper cup has increased tremendously year on year. To start a paper plate business, you will need high quality and efficiency paper tray making machines. And where can you find the best paper box making machine manufacturer? Here, I will recommend you to visit Win Shine Machinery Co., Ltd. Win Shine is a professional paper food packaging containers making machines manufacturer in Taiwan. They develop and customize a series of lunch box making machines to meet your requirement of paper food containers. If you have interest or have requirement of paper bowl making machines, no hesitation, check out Win Shine website or contact them at +886-4-2515-4999 for more details! Win Shine Machinery Co., Ltd.
What is ESD Access Control System? ESD access control system, anti-static access channel, stand-alone systems (integrated human static test access channel gate) is a combination of static test ban control gate and channel advanced products. In many settings electrostatic protection areas (EPA) in places where static footwear and static wrist strap testing are based on the traditional way of testing only be, difficult to implement untested first time by personnel prohibited from entering the case of the EPA. ESD access control system for this shortcoming, direct and effective solution to the problem, workers entering the EPA zone really good staff wear or anti-static wrist strap shoes ready, combine three roller gates, wing gates, swing gates, automatic door sensors, etc. As electronic locks or access gates ESD anti-static test personnel access control equipment. Plant personnel can provide basic access control functions and static test ways and orderly civilization, did not enter the EPA to eliminate electrostatic protection areas by electrostatic testers, and rapid control off the rod or gate, organize evacuations in case of emergency. Looking for Best ESD Controllers? Don’t Miss Pongee! Taiwan famous and professional access control system manufacturer, Pongee Industries Co., Ltd. also provides excellent ESD access control system. The advanced Pongee ESD ACS system is integrated with ESD Tester, contactless Access system and ESD Management Application software together. During the past time, many EPA (Electrostatic protection Area) control for the electrostatic shoes, wrist strap are almost tested then recorded manually so easy to make mistakes, this not only wastes time but not easy to audit. The Pongee ESD ACS system is managed by PC to make sure the person to test the ESD resistance value before entering EPA area, record the access time and control the turnstile or release alarm to reject illegal access. Also, with the failsafe function of the turnstile or electrical locks in emergency to secure the personal life. The system is mainly consisted of ESD tester, ESD access controller, management software, communicators and the electrical gate controller (turnstile, strike or power bolt). ESD permission has 8 options as checking Left and (or) Right hand and (or) the feet combination and the qualified impedance value range. The ESD tester PP-6750V/ESD provide permission level setting, inquiry, alarm function, test and record the PASS or NG judgment. The Access Controller equipped with LCD screen for taking the action, display the card & staff number, calendar year and date, clock, testing data and the error message. The access controller could control the intelligent gating devices such as Turnstile, swing gate or plate gate. Also, it could control the electric locks such as power bolt, magnetic lock or strikes. The user also could push the exit button to go out. The ESD ACS can be integrated with Time attendance module; it can provide the ESD ACS access events served as Time Attendance data base to make many HR reports. ESD access control system are used for SMT production line, clean room such as semiconductor fab, high tech RD room, or military ESD sensitive areas, explosive processing areas, maintain or calibration areas for aerospace industries, pharmacy , bio-chemical and hospital ESD restraint areas. If you have requirement or more information of ESD access control system, no hesitation, come and visit Pongee Industries Co., Ltd. for more details of access control system. For years of business, Sharp-Eyed Precision Parts Co., Ltd. has become the largest precision parts and surface treatment OEM in Taiwan. It provides brass nuts, clinching nuts, CNC machined parts, forging parts and surface treatment, and supplies to various automotive OEMs and other industries including bike, shipbuilding, medical, tool, and electronics. Sharp-Eyed’s automotive fasteners are mainly supplied to clients in Germany, Japan, China (Shenzhen), and Taiwan. For the domestic market, it offers automotive fasteners as well as bike fasteners, ship fasteners, medical fasteners and electronics fasteners. By integrating product design and R&D, it has earned the trust from the market. One of its clients is the world’s largest American bike components maker. Besides, it has become Taiwan’s largest core components supplier for smart watch. Sharp-Eyed is equipped with excellent sliding-head and turning-milling machines with processing precision ranging from 5µ to 10µ. It can produce customized parts of various special geometric tolerances according to clients’ requirement on the drawings. Sharp-Eyed insists on delivering only the best to their customers. They truly know that “Quality is the starting point of value and respect.” In order to assure product quality, they established the Reliability Laboratory to execute all kinds of tests. Customer’s trust reflects Sharp-Eyed’s worth. If you have requirement of OEM machining services, let Sharp-Eyed’s service become your best memorable lifetime choice. Sharp-Eyed Precision Parts Co, Ltd.
Buy ideal flexo presses, choose KYMC, the professional roll to roll printing machine manufacturer, will be the wisest decision. Since its establishment in 1968, KYMC has been producing a new generation of printing and converting equipment for the global market. To date, KYMC has served customers in more than 90 countries and has installed more than 2,800 devices. Their rich experiences and innovative DNA helped us to win over the trusts and supports of global customers in the flexible packaging industry. KYMC works with world-renowned and reputable suppliers to ensure the best performance and reliability of their equipment. The main advantage of KYMC is the quick return on investment of the machine, the direct service of the management and the use of the best components. KYMC helps their customers stay ahead of the competition and maintain market share. In the era of technology bloom, KYMC maintains the pinnacle of technology. To meet the Industry 4.0 market demand, KYMC is introducing equipment that are satisfying the need of “Always Connected” and “Constant Data Collection”, emphasizing on the integration of the platforms and the existing management system. They have helped our customers gain successful experience in the transfer from gravure printing to flexo printing, meeting the global value of green production and VOC emission reduction. They provide solutions and work hand-in-hand with our customers to get them through the transition period. With the strong worldwide demand for flexible printing, they are integrating digital printing technology onto their flexo press machines to successfully increase the flexibility of the production. Furthermore, KYMC has developed highly flexible, highly integrated machines to assist customers to meet the increasingly diversified product requirements of the coating and lamination projects. KYMC views each customer interaction heavily; they pursue the highest-standards of services for customers. As result the customer oriented after-sales services has helped them earned high reputation on the market. KYMC insists to provide the flexo press that delivers to customer will best suit their needs. Their mission is to satisfy customers from all aspect. Now, if you want to learn more or buy high-quality flexo press machines, welcome to check out KYMC’s website and feel free to contact them. Believe KYMC, they will be your best cooperation partner. Since its establishment, SIGMA CNC Technology Machinery holds the fundamental concept of “EXPERTISE, INNOVATION, and PERFORMANCE”. Led by President Humor Chuang, the efficiently co-operated teams are running the company’s daily operations. Under the leadership of their President, constant efforts, renovations are made to meet eve changing market challenges. With scientific management, they strive for high efficiency production, stable quality control, best sales and after-service of CNC double column machining centers. SIGMA is still a young manufacturer, but what makes them different is that many top engineers in the field who are with 10-20 years of experiences have joined them. This is their unmatched condition to have advanced research and development. Below, I will display SIGMA’s excellent CNC double column machining center. Let’s move on! SIGMA CNC Patent – Y-axis configured by 3-linear guideways (Roller type guideway, width 65mm) for horizontal and vertical directions that offer greater stability and rigidity for the machine. All three axes(X, Y, Z) are Roller type linear guideways. If you need more information of CNC double column machining center, I sincerely recommend you visit SIGMA CNC Technology Machinery – the company specializes in manufacturing kinds of CNC machines. 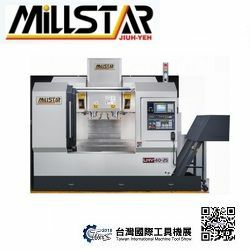 To get more details of CNC equipment, welcome to check out their website and feel free to contact with SIGMA. Taiwan International Machine Tool Show (TMTS) is the largest machine tool exhibition this year in Taiwan, which will present a complete and diversified industrial supply chain with intelligent functions such as temperature rise compensation, anti-collision, and process optimization for single machines, and the automated manufacturing cells and production line built by the “integrated machine tool and automation facilities” equipped with robotic arms. 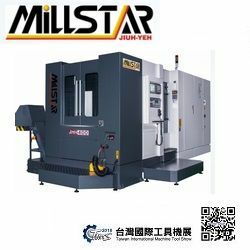 One of well-known Taiwan local exhibitors – Jiuh Yeh, will display Bed Type Vertical & Horizontal Milling Machine, Twin Spindle CNC Vertical Machining Center, and Horizontal Machining Center at their stall 4B326. Jiuh Yeh looks forward to seeing you at TMTS 2018! Come and Visit This Grand Event in The End of 2018! Jiuh-Yeh Precision Machinery Co., Ltd.
No.195, Rd.11, Ta-Li Industrial Park, Ta-Li Dist, Taichung City, Taiwan.R.O.C.